StopWatch Xtreme integrates with the popular app Alarm Clock Xtreme to solve all your timing needs. 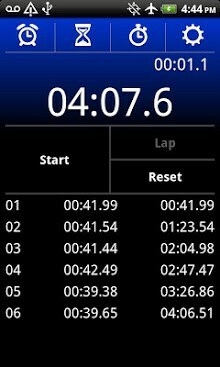 Use StopWatch Xtreme to keep track of split/lap times and total times down to 1/100 of a second. Use this app for games, sporting events, work, science experiments, etc. Stopwatch options also include the ability to use your device’s side volume buttons to start/stop the time, and to keep your device screen on while the stopwatch is running. You can also email the split/lap and total times recorded by the app and have a record of your times. 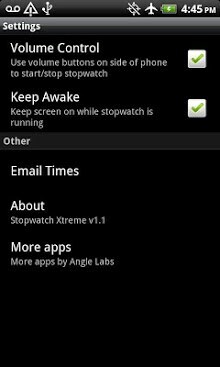 StopWatch Xtreme integrates seamlessly with the popular app Alarm Clock Xtreme. Download Alarm Clock Xtreme for an alarm clock and timer and solve all your timing needs with this pair of apps. Stopwatch Xtreme Free is ad-supported. The paid version of this app is the same as the free version except without the ads. Try before you buy. Upgrade to the paid version to remove ads and internet permission.